Home » Motorcycle Reviews • Sports Tourer » Video + Test: How good is the 2017 Kawasaki Ninja 1000? Video + Test: How good is the 2017 Kawasaki Ninja 1000? I can’t believe it’s been six years since I first tested the Ninja 1000, Kawasaki’s super-capable and super-versatile big-bore road bike. 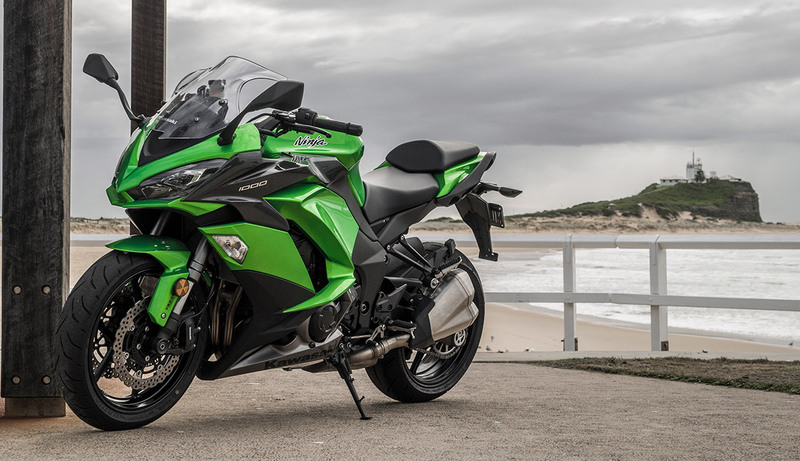 A sports-tourer, the Ninja 1000 really can cut it in commuting, having fun in the twisties and on the long-haul, especially with the optional panniers. And in 2017, the changes Kawasaki has made for this third version of the model are almost all for the better. Bodywork, style, convenience and electronics are where the changes have been made, to make the Ninja 1000 more comfortable, safer and better-looking. The bodywork offers increased protection and sharper looks. The style is more like the ZX-10R and supercharged H2, but the fairing is actually wider and both the rider and pillion seats have been reshaped for improved comfort. The new LED headlights look fantastic and the indicators are built into the fairing, cleaning up the lines. Another improvement to the style is the clean-mount pannier system, making the optional panniers even easier to fit while improving the style of the machine when they aren’t fitted. Most of the engine changes have been in the electronics, which I’ll be going into detail on, but the big hardware change is the slip & assist clutch, which makes it ultra-light to use while being almost impossible to induce compression lock-up if you bounce down too many cogs on corner entry. 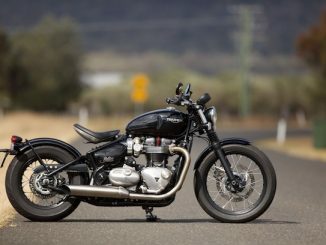 To call a bike a sports-tourer is to imply compromise – you can’t have the aggressive riding position, stiff suspension, peaky motor of a sportsbike in a machine designed to be ridden day-in, day-out with a passenger and a load. Conversely, touring bikes don’t respond well to being stuffed into corners and fired out and will probably scrape their guts out if you try. The screen on the Ninja 1000 is easily adjustable. Throw a leg over the re-shaped, slightly lower seat, reach out to the forward-set ’bars. Go on, you know you want to. This bike makes a lot of sense. Admit it – supersport bikes are for racetracks, and as much as you want one, you know they don’t make sense. And touring bikes, they are pigs in the city, in the heat… but you want to go fast and you want to go long. You want to go Ninja. This is a bike designed to be ridden decent distances, day-in, day-out. Not so much the 1000km days the GTR1400 is happy to do, but I’d be more than happy to put in a number of 5-600km days in a row, which really equates to starting early and finishing late, but taking reasonable breaks during the day, which is a great way to tour on a road bike in Australia. The riding position, seat comfort and weather protection are all a good compromise between sports ability and touring comfort. You can hang off and get your knee out, but you can also lift the screen and tuck in when the weather’s less than perfect. The riding position and suspension won’t smash you, nor will you feel stiffness at the end of a day. You won’t feel like you’re riding a whale on a winding road, either. The new fairing – wider, more roomy than before – encourages all-day riding. For 2017 the suspension has gained a new linkage and settings, but it’s been a while since I rode the older model and I didn’t really notice the changes. Indeed, the natural home of the Ninja 1000 is the winding country road. If the ZX-10R is best on a track, the GTR1000 on the open highway, the Versys 1000 on the rougher stuff, the Ninja really suits the fast country tour. It also happens to make a great big-bore commuter, and you’ll enjoy a ride day, too. I’m tall (185cm) and would chase up a taller double bubble screen to take a little extra wind off my chest in touring mode. The updated electronics are the headline act for the 2017 Ninja 1000. They bring the bike up to spec with the ZX-10R in most respects, the addition of a IMU (inertial measurement unit) being the most important part. 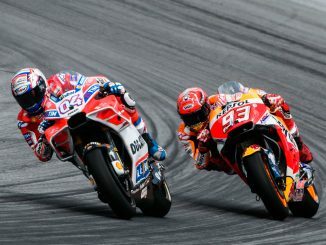 An IMU (inertial measurement unit) measures the roll, pitch and yaw of a motorcycle, which allows for mind-boggling electronic safety. 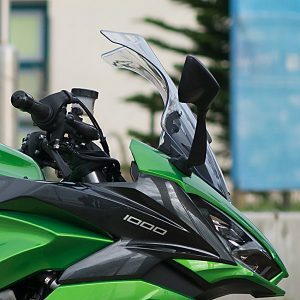 An IMU means the Ninja 1000 now has cornering power management and ABS, titled KCMF (Kawasaki Cornering Management Function). That sounds an awful lot like Big Brother is going to ride the bike for you – but it sits there in the background and only kicks in when required… if it functioned while I had the bike on test, I didn’t know it. As a bike tester it’s relatively easy to ride in a way which activates ABS (mash the lever), but getting cornering ABS to function basically requires you to screw up badly and then rely on the technology to save you – there’s a more than excellent chance I’d end up on my ear if I tried to test out cornering ABS and discovered it didn’t work as advertised – and I didn’t feel like writing this from a hospital bed. What I do know is I had lots of confidence diving hard into corners on the brakes and driving out early. I’ve been riding these technological marvels for years and I’ve experienced how much better they get with each generation. The traction control has numerous settings, including off, which you’ll need for wheelies, beyond that, on public roads, I struggled to find much difference between them. On the track that might be different. Another electronic update is the adoption of LED headlights and the front indicators are integrated into the bodywork. A slip and assist clutch smoothes downshifts and feels lighter at the lever. 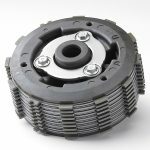 Kawasaki has been extending its Assist & Slipper Clutch to more and more models, and the Ninja 1000 is one of them. The design is ingenious: two cams function to essentially reduce the load on the lever in normal use (that’s the Assist part); and when under back-torque load the clutch can slip – so if you downshift into turns and dump the lever out the rear tyre is far less likely to lock up. This is another improvement in the bike for 2017, the new clutch being delightful to use. 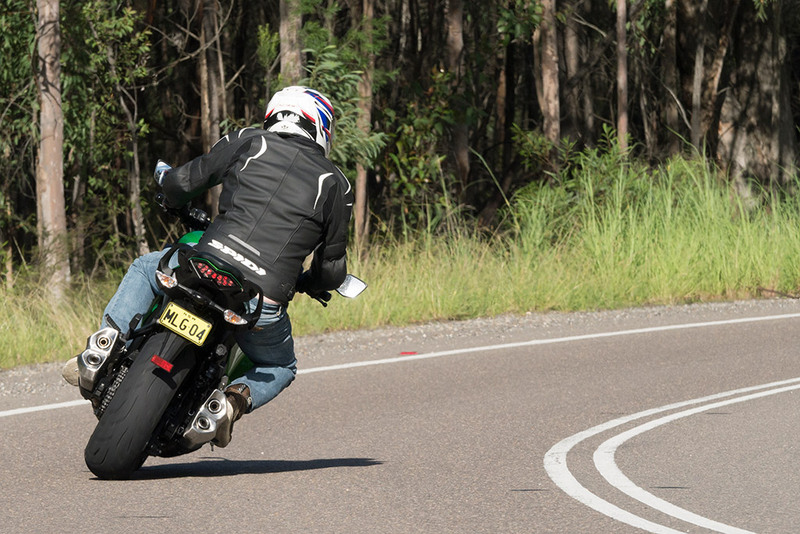 The slipper function isn’t likely to find a lot of use on a bike such as the Ninja 1000, but if you ever need it, it’s there – and could be a crash saver. 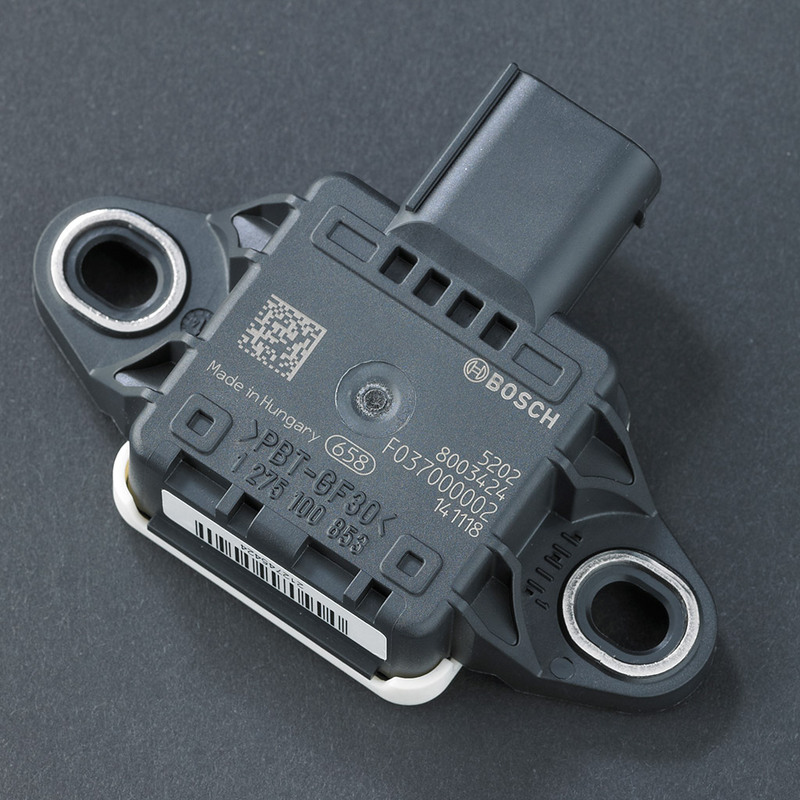 Kawasaki’s new Clean Mount pannier mounting system means the optional boxes are easier to use and keep the appearance of the bike cleaner, and importantly don’t interfere with the passenger grab rails like the boxes did on earlier models. Unfortunately the test bike didn’t come with the panniers, so we didn’t get to test them directly, but being colour matched and key-coded to the ignition key is enough for me to put down the dollars if I were buying a Ninja. Oddly, the press material describes the 19 litre tank as ‘large volume’. No it’s not – lots of sportsbikes have fuel capacities similar or greater than 19L… and it should be larger. I would have liked it to be around 24 litres, but 19 will put off some who are looking for a tourer. At least the tank is steel, so you can use a magnetic tankbag. The riding position would make dirt roads something not to be feared, but really, if you’re doing that, the Versys 1000 might be a better choice. The lack of cruise control is disappointing, as are the lack of heated grips – the latter is pretty easy to fix, the former difficult if not impossible – yet it’s only a few lines of code in the engine management software, so borderline an inexcusable omission in 2017. ZX-10R buyers will look at the Ninja 1000 and think “nice face, shame about the arse”. As a sportsbike, the Ninja is heavy, but that comes with protective fairings, passenger comforts, luggage capacity, a steel tank and an affordable price. Still, the engine is willing, the suspension pretty good (and highly adjustable) and there’s even more cornering clearance than I expected, but I didn’t get to ride it on a track. Really, I don’t think I’d be really any slower riding a Ninja 1000 up a winding road than I would be on a ZX-10R, so if going to track days is a secondary consideration, the sporting abilities of the Ninja 1000 are probably more than you need. 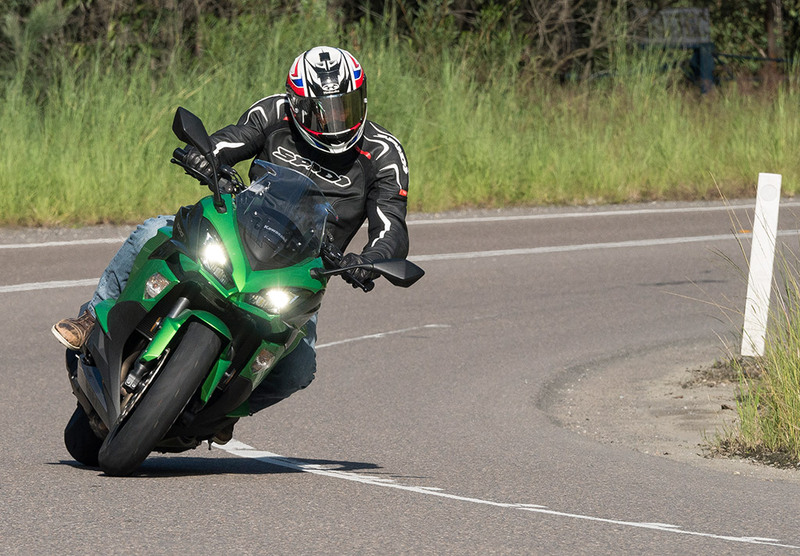 If you’re after one machine that’ll do lots, the Ninja 1000 might be your winner. It truly is comfortable and capable at every type of road riding – commuting, touring, blasting. It’ll do it solo, it’ll do it two-up, it’ll do it anywhere and everywhere. It’s at the extremes the compromises start to show up – no cruise control touring, heavy for a sportsbike, costly for a commuter. You get that. The dream of a bike which can do everything perfectly is a fantasy, it’s why we have specialist machines – and Kawasaki has more than most. The ZX10R and GTR1400 (which, as we go to press, looks like being replaced with a new supercharged machine) represent the extremes of sports and touring from Kawasaki’s perspective. The Versys 1000 leans more towards touring, being the pick of the bunch if unsealed roads are on your itinerary. But if you rarely have dirt under your tyres the Ninja 1000 is the machine which can do it all, do it well, and do it very affordably. It truly is a great bike. Nigel wears a Kabuto helmet, Spidi jacket, Draggin jeans and MotoDry boots. To find out more about the Ninja 1000, including dealer information, go to Kawasaki Australia’s website.